Now that Republicans’ efforts to repeal and replace Obamacare are finally dead -- this time for good -- Congress can actually do what the American people want, which according to a poll, is improving Obamacare -- not repealing it. The Congressional Budget Office released a preliminary report revealing that the Republicans’ last-ditch effort to repeal and replace Obamacare would result in millions of Americans losing health insurance. The result was Maine’s Republican Senator Susan Collins opposing the bill, which was a third vote Senate Republicans couldn’t afford to lose. The now bipartisan effort to improve Obamacare, for which Republican Senator of Arizona John McCain has called, began with a health care debate broadcasted on CNN, Monday. It revealed opportunities for Congress to improve upon Obamacare -- if Republicans are willing to work with Democrats to pass legislation. The four Senators participating in the debate were Democrat Amy Klobuchar of Minnesota, Independent Bernie Sanders of Vermont, and the Republican writers of the latest effort to repeal and replace Obamacare, Lindsey Graham of South Carolina and Bill Cassidy of Louisiana. The debate remained cordial for the most part, with moments of consensus indicating a bipartisan bill is indeed possible. Graham pointed out that since the passage of Obamacare, the money has continued to flow away from Americans to health insurance and pharmaceutical companies. He cited the profit increases of the major health insurance providers, with all six of the biggest seeing their stock hit all-time highs this summer. This was music to Sanders’s ears, who acknowledged his Medicare-for-All bill introduced in the Senate won’t pass and that a bipartisan effort to improve Obamacare should be the short-term focus of Congress. Cassidy even seemed to agree that something needs to be done to reign in the prices Americans pay for prescription drugs. Since Congressional Republicans held the longest roll-call vote for the Medicare Modernization Act, or Medicare Part D law, back in 2003, the federal government has been barred from negotiating prices with pharmaceutical companies. According to a 2016 Reuters report, prices for four of the nation's top 10 drugs increased more than 100 percent since 2011. The report also shows that sales for those 10 drugs went up 44 percent between 2011 and 2014, even though they were prescribed 22 percent less. Prescription drug expenditures account for 20 percent of healthcare costs. But when Sanders asked Cassidy if he would vote for a bill to reverse the Part D law, much like Klobuchar’s Medicare Prescription Drug Price Negotiation Act, Cassidy instead called Sanders a Socialist who wants to commandeer the formulas for medicines to be produced by the State and disincentivize medical innovation. A 2016 Kaiser Family Foundation poll found that Cassidy is part of a very small minority on the subject, with 93 percent of Democrats and 74 percent of Republicans in favor of the government negotiating Part D prescription drug prices. The problem, though, is that Congressional incumbents rely on pharmaceutical companies to win elections, which will make both Republican and Democratic votes hard for Klobuchar to attain. 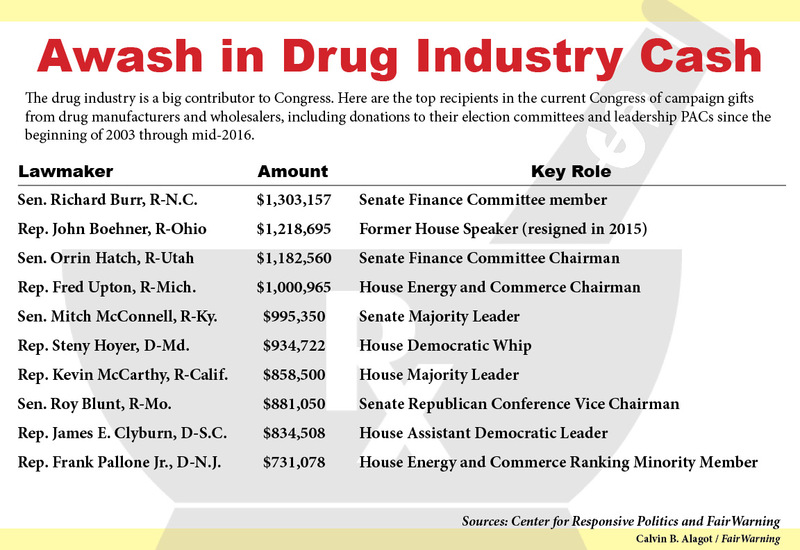 Senators Richard Burr of North Carolina, Orrin Hatch of Utah, Mitch McConnell of Kentucky and Roy Blunt of Missouri will likely join Cassidy as “no” votes on Klobuchar’s bill, given the donations their campaigns received from the prescription drug industry totalling $4.35 million between 2003 and the middle of last year. Another obstacle for Klobuchar’s bill is the fact that this time last year, there were 894 pharmaceutical lobbyists to the 535 members of Congress, with more than 60 percent of them having previously served in Congress or worked other government jobs. It seems the prescription drug industry provides nice retirement work for former government officials, which incumbents won’t want to see go away. So while CNN’s healthcare debate provided opportunities to improve Obamacare, Congressional corruption presents obstacles to overcome in order for Americans to see their healthcare costs decline. It’s no secret that Americans pay more for healthcare than anyone in the world, and it’s increasingly less of a secret that a better system would result in fewer infant deaths, fewer preventable deaths, fewer uninsured people, and less expense for Americans. What does that system look like, though? Well, it’s not privatized health insurance. The problem with privatized health insurance is that it allows or forces people to go uninsured due to cost, which is why President Barack Obama’s Affordable Care Act is so important. It lowered the number of uninsured to an all-time low of 8.6 percent by forcing affordable coverage options upon them (if you live in a state that expanded Medicaid) or forcing them to pay a fine so the insured wouldn’t have to flip so much of the uninsured’s bill. And while healthcare costs are still increasing (they always will), they are increasing at a slower rate than they were prior to the ACA. The biggest reason socialized healthcare is difficult for Republicans to stomach is because they don’t trust the federal government to handle healthcare. You hear them say that over and over, and that the states can do it better. I don’t disagree, but if India can provide free healthcare to roughly 276 million Indians living under the poverty line, the American government can certainly do it for 43.1 million impoverished Americans. States should not be allowed to opt out of this coverage. It should be mandatory because those with private insurance would be paying for fewer uninsured visits to the hospital, meaning hospitals wouldn’t have to increase costs for everyone because of the $900 each uninsured visitor costs them annually. The House Republicans’ American Health Care Act won’t be passed by this Congress, either. At least not how it currently stands. But minimum wage legislation should appeal to constituents and politicians of both parties. The biggest problem for Americans isn’t increasing health insurance premiums. The biggest problem is stagnant wages, which is why passing minimum wage legislation is so important. Back in February, the U.S. inflation rate was at its highest since 2012. An item that cost $20 back in 1997 would cost $30.38 today. That’s a cumulative rate of inflation of almost 52 percent in 20 years. 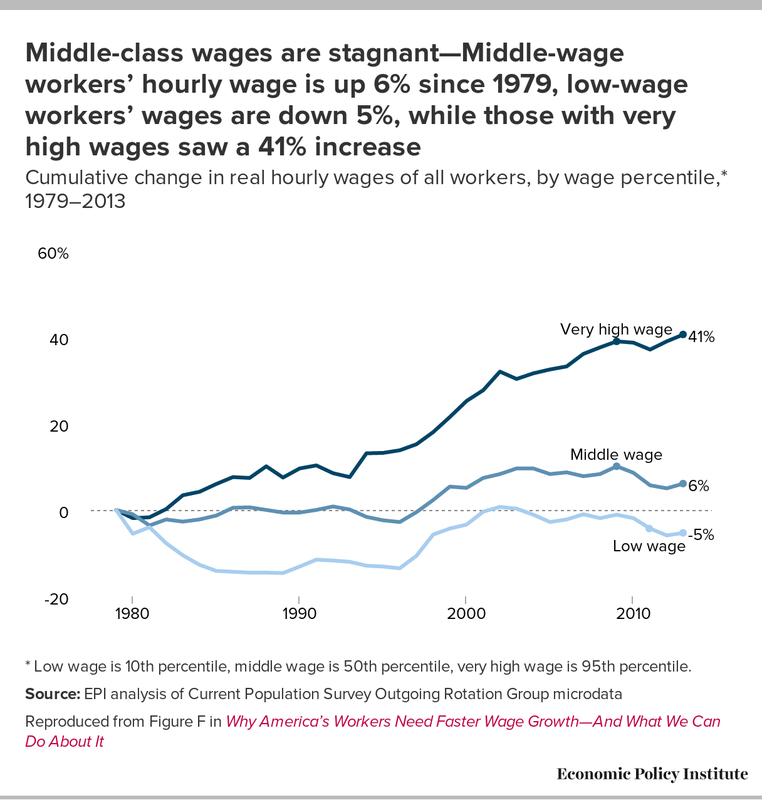 Middle- and low-wage workers’ incomes grew just over five percent during the same period. When the value of the U.S. dollar decreases 10 times faster than incomes increase, people struggle to pay for everything. My father and an entire district of a machinists’ union didn’t get a raise for the eight years Ronald Reagan was President. Imagine working for the same wage for nearly a decade while the cumulative rate of inflation increased 36.4 percent over that time. By the end of the eight years your 1981 U.S. dollar was worth just 63.6 cents in 1989. 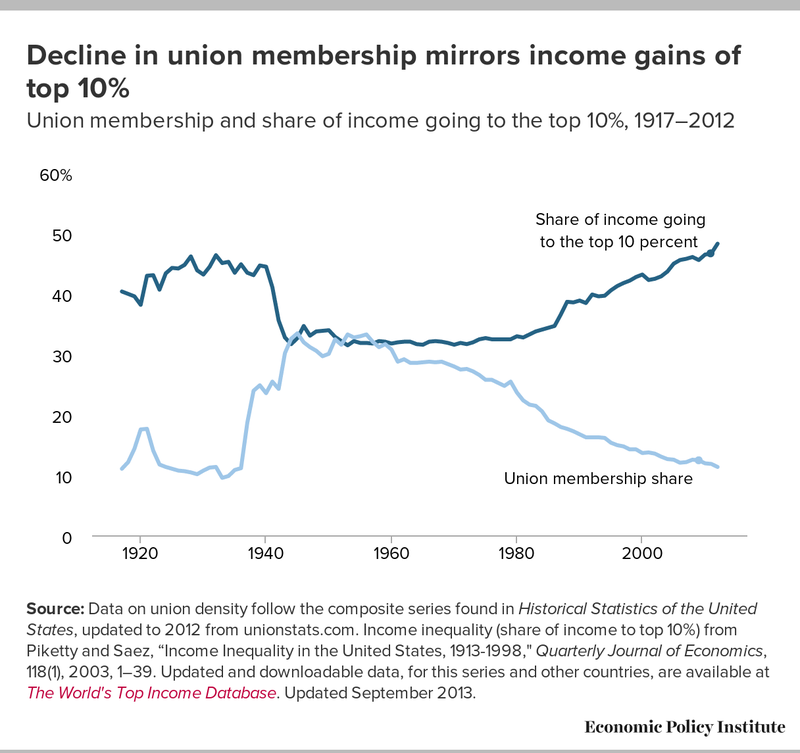 The lack of union membership in America has a lot to do with the increased income for the top 10 percent of earners, too. While the globalization of the economy makes executives more valuable, a lack of union membership and lack of collective bargaining allows executive salaries to inflate. And while the affordability of commonly used items like refrigerators, ovens, etc. has increased according to the CATO Institute, that doesn’t necessarily offset the ever-increasing cost of energy. Between 2005 and 2015, residential energy costs increased 34 percent despite prices of natural gas delivered to electric utilities declining nearly 60 percent and coal prices remaining essentially flat, according to the Institute for Energy Research. And we all know that gasoline is more expensive. Today’s average price for gasoline is 54 percent more than the inflation-adjusted price of 1998, when oil prices reached an all-time low of $18.13 per barrel. Secondary education continues to be an increasing expense, which increased on average at a rate of nine percent at four-year colleges, 11 percent at two-year colleges and 13 percent at private colleges since 2011-12, according to CollegeBoard. “But you don’t need a college education,” you might say. Sure, you might not need it, but the value of of a secondary education was double that of an equal investment in the stock market back in 2011, according to the Brookings Institute, and USA Today reported that a New York Fed study determined the net present value of a college degree to be at an all-time high of $300,000 back in 2014. Education isn’t the only thing that’s steadily increased in cost, either. The median cost of rent has increased 64 percent since 1960 and 12 percent from 2000 to 2010 despite median wages falling seven percent during that time, according to ApartmentList. The Consumer Price Index for food is also 2.4 percent higher than it was just a year ago, according to the United States Department of Agriculture. While Republican politicians have no interest in socialized healthcare legislation or minimum wage legislation, they should if their goals entail more American jobs and a flourishing American economy. Socialized healthcare legislation, like Rep. John Conyer’s Expanded and Improved Medicare for All Act, and minimum wage legislation, like Rep. Al Green’s Original Living Wage Act, would allow Republicans to create more jobs and allow Americans to further stimulate the economy with expendable income. No Conservative who is struggling to pay for necessities can successfully argue that they don’t deserve a raise, and no Republican politician can successfully argue that his or her struggling constituents don’t deserve a raise and keep his or her job. This is something Congress can pass and something Donald Trump should be proud to sign. It would be quite the blow to his predecessor if Trump managed to increase wages for all American workers making minimum wage. It would certainly make the numbers look better if Trump and the Republicans are successful in passing their healthcare bill, as more Americans would be able to afford health insurance.